Prominent Papua New Guinean journalist, columnist and journalism teacher Kevin Pamba has become the news over the Ramu nickel mine controversy. Aid activists allege he is too close to mining interests and claim he was involved in an "interview" incident where a landowner opponent of the mine was assaulted in Madang. The bombing of the Greenpeace ship Rainbow Warrior by French secret agents 20 years ago highlights the hypocrisy surrounding the war on terror, says the author of a book about the sinking of the protest ship. 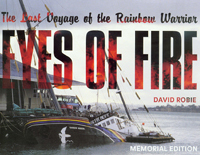 Speaking on Waiheke Island on Saturday at the relaunching of an updated edition of Eyes of Fire: The Last Voyage of the Rainbow Warrior, David Robie said there was a lot of hypocrisy about terrorism. The French sabotage of the Rainbow Warrior 20 years ago tomorrow backfired disastrously. Mounting Pacific and global pressure forced France to abandon nuclear testing 11 years later. 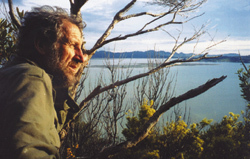 DAVID ROBIE, the only New Zealand journalist on board the bombed ship, looks back on the legacy of this sordid act of state terrorism in a New Zealand port. Peace campaigner Owen Wilkes took his own life last month, leaving partner May Bass utterly bewildered that she'd never seen it coming. she talks to Denise Irvine about a man who 'didn't realise how much he was loved'. PARDON ME: WHAT IS FIJIAN RECONCILIATION AND RESTORATIVE JUSTICE? 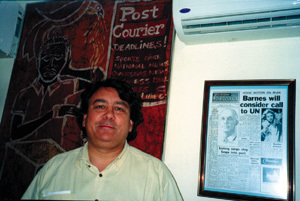 Coup plotters in Fiji trying to stage another "56 hostage sideshow" would face major regional military intervention, warns Michael Field, co-author of a new book about the failed May 2000 putsch. 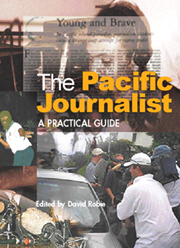 Do Pacific journalists need a university-level education? Are there really cultural differences between western and Pacific styles of journalism, and are local reporters doing a good job? Bruce Hill speaks with David Robie, Associate Professor of Journalism at the Auckland University of Technology, about his experiences training reporters in PNG and Fiji. David Robie says media in the South Pacific is a revolving door -- bright young graduates arent paid well enough to face the stressful and often dangerous job of being reporters. Citizens of the politically turbulent states that are New Zealands neighbours deserve better news media. David McLoughlin talks to an old Pacific hand, the author of Mekim Nius. Journalism programme round-up of Mekim Nius book launching pictures and story at Auckland University of Technology. New Zealand must take a higher profile in media training and help raise journalism standards in the South Pacific to strengthen democracy in the region, says an AUT academic and author of a book being launched next week. 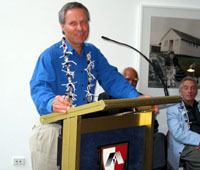 Dr David Robie, author of Mekim Nius: South Pacific Media, Politics and Education, says more effort needs to be made to boost the regions media skills in reporting national development and covering conflict, coups, sedition, treason, human rights violations and corruption. 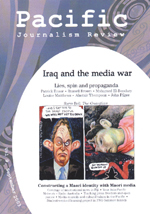 Anyone wishing to understand the intricacies and challenges of practicing and teaching journalism in the South Pacific will find Mekim Nius, the latest publication by David Robie, an authoritative and informative source ... This book is a wake-up call to the Pacific media industry and governments over pay, working conditions and training for journalists. Fresh tensions between government and rebels in the two countries worst hit by the tsunami disaster threaten to undermine aid efforts. In Sri Lanka, the Tamil Tigers have warned of serious consequences if government soldiers are not withdrawn from welfare camps. In the Indonesian province of Aceh, the government and rebels have accused each other of attacks.